It is estimated Lake Thetis WA became isolated from the sea about 4800 years ago when sea levels dropped and coastal dunes formed around the Lake. The lake is one of only a few places in the world with living marine stromatolites, or 'Living fossils'. The microbes that build stromatolites are a species of cyanobacteria and are similar to those found in 3500, which are the earliest record of life on Earth. 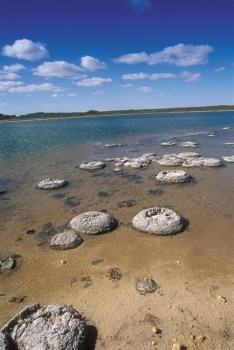 The lake's stromatolites that look like rocky lumps have been dated to about 3370 years old. Stromatolite communities grow as the this layer of bacteria on their surface deposit calcium, cementing sediment into bulbous structures.